Last night I attended a small class at REI in Austin that covered camp stoves and water filters and purifiers. It was hands-on, and the 6 of us who attended were able to assemble, fire up and boil water on about eight different stoves, as well as try out several water filters and purifiers. I’ve been using an MSR Whisperlite stove for several years, and chose it mainly for the ability to use unleaded gasoline in it. This allows me to always have fuel for my stove in the bike, and not have to worry about finding fuel canisters or white gas in remote places. After trying the different stoves last night, I was almost convinced to switch to a JetBoil or a SnowPeak GigaPower (wow, it’s small but works great! ), but I’m still concerned about finding fuel canisters, and how long one canister of fuel will last. I’m on a small bike, with limited space, so carrying more cans isn’t easy. With my Whisperlite, one fuel bottle is all I ever have to carry, and it fits in a bicycle bottle cage on the rear of the pannier. So I’ve talked myself back into keeping the Whisperlite for now. The water filters and purifiers were another topic of interest. I have a Steripen purifier, but no filtration system. Based on what I learned last night, unless I’m pumping water from muck, I think I’ll be okay with this setup for my intended purposes. The Steripen has its limitations, but I’ll deal with it. I also met another attendee at the class who had just returned from five months in India, Nepal and Thailand. It was great to chat with him and learn a little more (and confirm that I’m headed to the right places). With the very reasonable cost of lodging in Mexico, Central and South America, it’s been tough to commit to carrying all of my camping gear for this part of the trip. 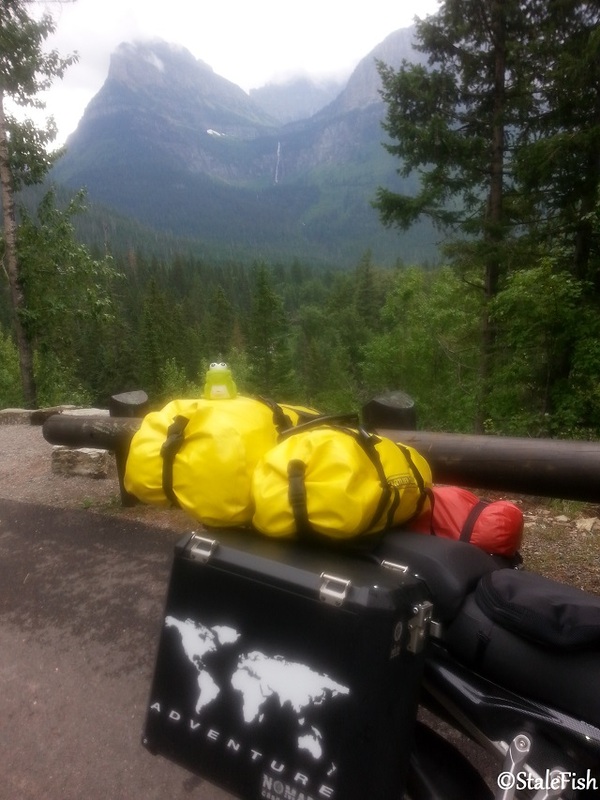 I could lose 20 pounds of gear and a large bag by staying in hotels, hostals, AirBnB, etc exclusively and not camping. But part of my goal for this trip is to keep the overall costs down, so the camping gear comes along. For now…. Each morning I’ve been working on the bike in the early hours before work, while it’s still a little cooler. I have a single car garage at my apartment, and it faces west. So it’s much cooler in the morning than in the late afternoon/evening. Working with only a small set of hand tools and on the ground (no lift, no bench, etc) isn’t what I’ve been used to the last few years, but it’s good practice for the next year. At least it’s clean concrete and not dirt or mud! Installed a new set of Holan Nomada II panniers. I have this brand on my Super Tenere as well, and really like them. Installed a new mounting cradle for my Garmin GPS. The previous one failed in Mexico. Over the next few days, I’ll re-pack the bike using my checklist and make sure I haven’t missed anything. The idea of a Round The World motorcycle adventure first lodged in my brain while in college, when I took my first long distance motorcycle trip, in the summer of 1981, on a Yamaha Seca 550, from Texas to Canada and back. The day-to-day feeling of freedom and lack of commitment (other than having to get home before running out of money and before school started again) was exhilarating. Not long after that, the real world took hold, and work commitments limited my motorcycle tours to a couple of weeks a year at the most. But the idea of riding off into the sunset was always there. Priorities began to be re-examined. Yes, I could continue to earn a nice living working at the job I’d held for the last 26 years. Retirement would be a possibility at least if I continued to contribute to the idea of retirement for another dozen or so years. But of course, there’s no guarantee that I would even be around at age 65 for that “gold watch” and pat on the back. No guarantee that I would be employed, no guarantee that I would even be breathing. It’s funny how when you’re in your teens, 30 seems old. When you turn 30, people kid you that you’re “old”. At 40, they joke that you’re “over the hill”. When I was 45, I felt physically and mentally like I was 25. I never had that feeling of “getting old” until I hit 50. Then it hit hard like stepping in front of a truck. Suddenly I got injured more easily. My body didn’t heal as fast as it used to. My eyesight finally started getting worse (hey, I made it a lot longer than most of my friends before buying the Walgreen’s reading glasses). 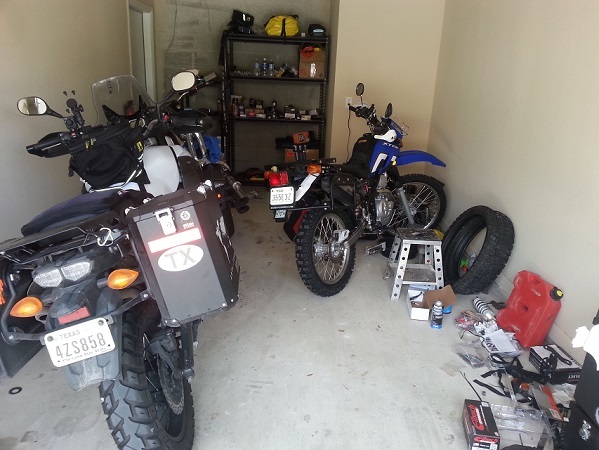 At the beginning of 2014, I decided to start a major downsizing, selling off my motorcycles, car, house, and just about everything else. My only debt was my mortgage, but it was a big one, and if I could eliminate that monthly expense, then there was little preventing me from actually taking off. I started reading blogs of people who were currently riding around the world, or across the Americas. I bought the Horizons Unlimited video series on adventure touring, and while the whole set is very informative, it was the people presenting the information that stood out: these were, for the most part, just normal couples, or single riders, who had decided to find a way to make this lifestyle work. They weren’t independently wealthy. They weren’t backed by major sponsors. They were living on a budget, spending their savings and/or working when necessary, and seeing the world. This was more reassurance that it could be done. I joined the Austin, Texas HU Community, and shortly after received an email from Paul from Australia, who was traveling through Texas on his way to Mexico and points South. Paul visited for a couple of days and shared maps, plans, budgets and stories. A couple of weeks later, Glen and Leeanne, also from Australia, showed up on their way across the US. I felt like a grade school kid, full of questions and wanting to learn all I could from their experiences. I gained a lot of information on packing, bike setup, and more. Sure, I could’ve learned all of this myself on the road, but why not start the trip with the right stuff (and not way too much extra, unneeded stuff)? Visiting with other travelers has certainly made planning smoother. Last August I rode the Super Tenere to Nakusp, BC for the Horizons Unlimited Travellers Meeting, to meet other like-minded Overlanders, and spent a few weeks doing a “shakedown” of gear. Along the way, I rode with my friend Tom to the Northwestern US as part of his RideAbout65 travels. 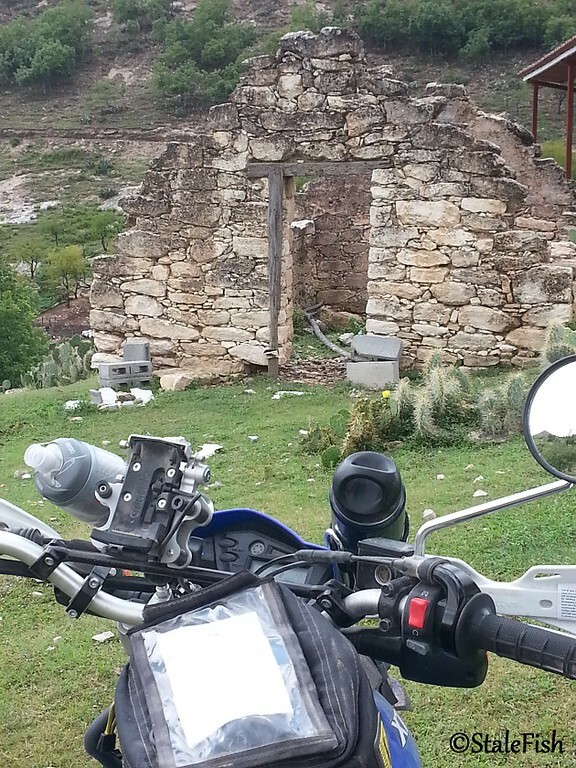 Last month, I took two trips to the mountains of Nuevo Leon, Mexico, on the XT250 to shakedown a revised, slimmer set of gear. So here I am, in deep. The house is sold, and I’m living in a one bedroom apartment, on basically what I will be taking with me. Counting down the days. The bike for the trip has changed over the last year…downsized as well, in a big way. The first part of the route is roughed out. Immunizations are done. Travel Health Insurance is researched and about to be purchased. I’ve dreamed about this trip for more than 30 years. In the last year, as the trip became a reality, it has morphed several times. In some ways I’m running from ghosts. In some ways, I’m trying to prevent this from becoming a “guilt trip”. It was never intended to be any of those things. The past has a way of following us. For me, it’s always been about experiencing other cultures, from the inside. Seeing and feeling things that can’t be experienced in the United States. Learning to appreciate the differences — and similarities — between us. Pushing myself to accept what comes on a daily basis, and maintain a positive outlook regardless of the hardships. After all, if it isn’t difficult at times, it’s just a vacation and not an adventure.